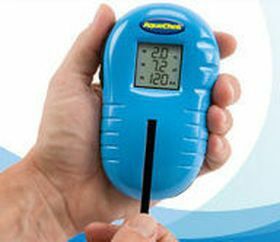 Aquachek Trutest pool water test meter is specifically developed for pool and spa owners. The AquaChek TruTest Digital Test Strip Reader combines the ease and accuracy of AquaChek test strips with advanced digital technology. Now there’s no guesswork required to interpret colour results – just dip a test strip in your pool or spa, insert in test strip reader and get fast, accurate digital results in seconds! • Large, easy-to-read LCD screen that displays test results. Q: What can I expect for the precision of the test parameters? It can be noted that as with any test, technique consistency will improve precision results. Q: What is the dynamic test range for the TruTest? It should be noted that the Er messages will be displayed when testing pool samples outside of these calibrated test ranges (reference in the manual). Q: Can I compare the TruTest results to other test methods? A: The accuracy of the unit should only be compared to visual test methods. This is because the unit is capable of reporting numerical results between colour blocks and therefore the unit can be considered to be more accurate than a visual colorimetric evaluation (involving both human interpretation and interpolation). Digital readout in place of colour interpretation is TruTest’s main benefit resonating with many pool/spa owners. Q: How long will the batteries last? How long will the unit last? A: The AA batteries should last an entire pool season’s worth of testing. The display window will flash “LO” if the batteries are below a certain level of power needed to perform a test. The unit has been developed for the consumer’s pool environment. With good cleaning and storage habits, the meter should last longer than 3 years. Q: Why does the unit sometimes not appear to stay “ON”? A: The “on” button if depressed quickly on and off can cause conflicts with the software, appearing to not “stay on (or off)”. Simply waiting a minute or so before pressing the ON button should help clear the cycle. Q: What does "LO" in the TA location of the TruTest meter display mean? A: The meter displays "LO" in the TA location when the battery voltage drops below the permissible limit. Start and Scroll functions are disabled and the meter turns off automatically within 3-5 seconds. Even if the meter is turned ON again, it would turn off after displaying "LO". If a low battery condition is detected during the Test/Run cycle, instead of pool values the meter returns a "LO" on display at the TA location and turns off. Q: How should I be cleaning my TruTest? A: A simple, non-abrasive wiping of the test strip window and all other surfaces with clean, fresh water should clear any residual chemicals remaining from pool testing. Q: What will happen if the meter falls into the pool/spa? A: The meter was designed to withstand this kind of accidental submersion and should float upon entry into the water. Simply remove the meter, take out the batteries from the battery compartment, dry the battery compartment thoroughly and replace with dry batteries. The meter should return to full performance. Q: Should I “place” or “slide” the test strip onto the test strip window? A: It is very important that you do not slide the test strip on the window. This action will result in inaccurate readings. A simple method is to place the first pad nearest the top of the strip onto the window first, then lower the rest of the strip down onto the window. This will ensure that the strip is all the way in and down onto the window. If ER appears in place of a numerical value – the test result is out of range. The parameter is either too high or too low to be accurately analysed. Note the status level, LO or HI to determine how to treat your water. Re-test after treatment. If ER2 appears on the screen – there is an error in reading the test strip. Ensure that you are following the test procedure correctly. Use only AquaChek® TruTest instrumental test strips. No other test strip can be used. If ER3 appears on the screen – no strip is in place or the test strip is positioned incorrectly. The correct position is with the test pads face down in the slot with the top pad all the way to the top. The AquaChek® TruTest test strips are calibrated to work only with the AquaChek® TruTest test strip reader. Each strip may only be used once. Do not re-dip the strip. Only dip the strip in calm areas of your pool or spa. Ensure you have a fresh supply – keep cap on tight between uses and store at room temperature.